A Quitclaim deed (commonly misspelled as quick claim deed or quit claim deed) transfers or "quits" any interest in real property. The grantor may not be in the title at all, so the grantee cannot assume that the grantor has any real interest to convey. It could transfer an acquired interest. For example, if the grantor were, say, married to the owner of the property, signing and recording a quitclaim deed in favor of the spouse would transfer any interest the grantor may have acquired in the property to the spouse. If a person wants to sell an interest in a property, that person would not use a quitclaim deed. An acceptable type of deed to utilize the sale of a property or the sale of an interest in a property would be a warranty deed or a grand deed. Further, there are also circumstances that might call for an Interspousal Deed in-lieu-of a quitclaim deed. A quitclaim deed is different from an Interspousal Transfer Deed. Prior to 1990s, it was common to use quitclaim deeds for transfers between spouses. Somewhere along the line, purportedly in the early 1990s, Interspousal Transfer Deeds became the deed of choice to transfer or clarify a transfer of real property between spouses. The Interspousal Transfer Deed relates to Section 63 of the Revenue and Tax Code, which allows a transfer of property between spouses as exempt from transfer tax. It goes a step further than the quitclaim deed, in case you're wondering why the interspousal transfer deed has gained popularity over the quitclaim deed. The quitclaim deed transfers any interest the spouse may have or may have acquired at the time of transfer. It does not necessarily account for an acquired interest after the fact, like years later. An Interspousal Transfer Deed, with the corresponding box checked, relinquishes any further claim of community property. It can be signed by a current spouse or a spouse in the midst of a separation or going through final divorce proceedings. There is no transfer tax due on the property transferred by an Interspousal Transfer Deed. Transfer tax is a state and/or city tax. In California, for instance, the state charges a fee paid based on 55 cents per $500 of value. Does a Quitclaim Deed Take a Borrower off the Mortgage? 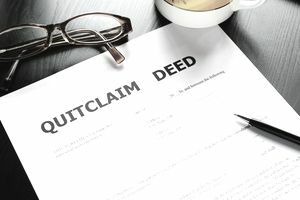 A quitclaim deed does not remove a borrower's name from the mortgage nor relieve the borrower from responsibility for payment of that mortgage. This is a popular misconception. Some homeowners think if they remove themselves from title to property that their name is automatically removed from the loan, and it doesn't work that way. Only a refinance, a payoff of the mortgage, or sale of the property which results in a payoff of the mortgage or at the lender's option, relieves the secondary borrower from the obligation. Take the case of a married couple in California who have long since divorced and now the spouse remaining on title wants to do a short sale, for example. Often the spouse who is not on title is shocked when the short sale bank asks to include the spouse in the short sale proceedings, meaning the spouse would need to submit tax returns, bank statements, and payroll stubs, just like the spouse who is in title. The short sale might also affect the non-titled spouse's credit report as well. While you can download a quitclaim deed from many websites, if you want 100% confidence that your quitclaim deed was prepared properly and that your interests are protected, it is considered wise to hire a professional licensed to prepare legal documents such as a lawyer. Title companies used to provide this type of service as an accommodation but most no longer do so. What's a Purchase Money Loan? What Is the Documentary Transfer Tax, and Who Pays It?